Milk and unsweetened dairy foods including cheese and yogurt help to maintain healthy teeth. They contain the minerals calcium and phosphorus, which we need for strong enamel, and they’re not acidic so they don’t cause erosion. Eating hard cheese also helps to stimulate production of saliva, which further reduces acid levels in the mouth after meals. Adequate saliva flow also helps rinse your mouth of food residue. There is evidence that compounds in dark chocolate are effective against plaque and tooth decay. An extract from the cacao bean husk has been shown to fight the bacteria associated with dental caries and therefore reduces acid production in the mouth. It also helps harden tooth enamel. Most of us aren’t going to be chewing on raw cacao beans but we might be able to gradually wean ourselves away from sweet milk chocolate to low sugar, dark chocolate. Chewing low-acid, sugarless gum after meals can help maintain healthy teeth by increasing the flow of saliva. This helps wash away food debris and neutralises other acids in the mouth. Increased saliva flow also carries with the minerals such as calcium to help strengthen tooth enamel. Look for gum approved by the Australian Dental Association. Sweet or acidic drinks including soft drinks, fruit juice, cordials and energy drinks should be off the daily menu for anyone concerned about healthy teeth. Most drinks except for water and milk are already acidic and bacteria in your mouth create more enamel-destroying acid when they feed on sugars. Many drinks will also stain your teeth but drinking through a straw will keep the fluid off your pearly whites. Sports drinks are acidic and high in sugar. For the average person, water is the best fluid for hydrating or rehydrating before, during or after exercise. If you do use sports drinks, squirt them into the back of your mouth to avoid your teeth and rinse with water afterwards. Studies have found it is the frequency of exposure to sweet foods as well as the quantity that is strongly associated with dental decay. So if you must eat sweet foods, restrict them to meal times and avoid snacking between meals. Between meals, encourage snacking on crunchy, raw vegetables such as celery and carrots for healthy teeth. Protect your smile from external forces by investing in a mouthguard - preferably one custom made for your mouth. Athletes who play contact sports such as football and hockey are in greatest need, but chipped, broken, loose or lost teeth are common in many other sports when contact is made with a person, ball, bat or hard surface. As well as protecting your teeth, mouthguards protect against jaw injuries and concussion. Many common medications can block the normal level of saliva production necessary for healthy teeth. Some of the medications most likely to cause a dry mouth include antihistamines, antidepressants, blood pressure tablets, antibiotics, drugs for gastric reflux, bronchodilators, strong painkillers and ‘fluid pills’. Pay particular attention to oral hygiene if the treatment is short term but talk to your doctor about how to maintain healthy teeth on longer-term treatments. While 80% of children have annual visits to the dentist for check ups and preventive treatment, adults seem less vigilant. 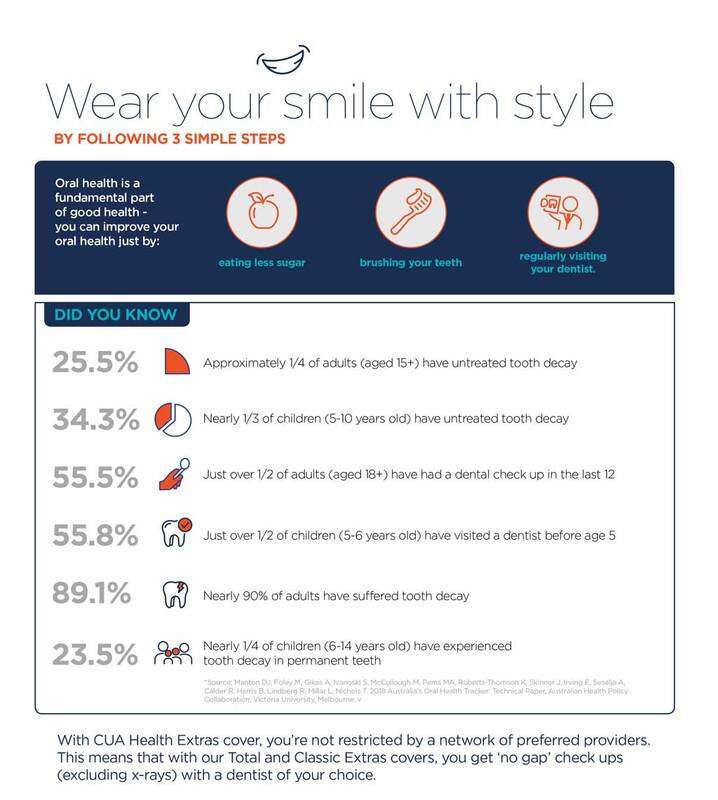 Just over half (55%) of adults 25-44 years have seen a dentist in the last 12 months. 45-64 year olds are more like to visit the dentist for problems with their teeth. Yet the facts speak for themselves. People who regularly see the dentist are more likely to have healthy teeth. With our Extras covers, you're not restricted to a network of preferred providers - so you can choose when and where you're treated. Plus, bonus dental check-ups and loyalty bonus on some Extras covers. Temptation is everywhere - fast food outlets on every corner, coffee and muffin runs from the office, and a pantry full of treats at home.